We work closely with a number of generous donors that want to give back to their local communities and support causes that they are passionate about. 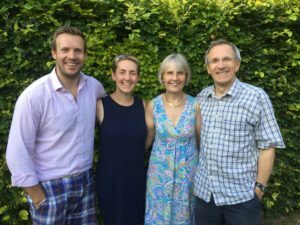 Following careers as an actuary and teacher respectively, Nigel and Alison helped to establish a youth project in one of the most socially deprived areas of Surrey. We have been very fortunate and we wanted to share our luck with some of those who were less privileged. Through establishing a youth charity in Surrey, we learned how a small amount of money could make a difference to the lives of those experiencing disadvantage. Applying for funding for the charity brought the family into contact with the Foundation for the first time. After making several grant applications, it was clear that the Foundation provided an indispensable service bringing together those who had money to give with those who needed funding. Most importantly, they were professional in making sure that the money was used appropriately by the charities. Establishing our own fund with the Foundation seemed the right thing to do. The fund includes Nigel and Alison’s children, Carol and David, and their families and so their endowment will continue making gifts on behalf of the family well into the future. They have particularly loved visiting the projects that they have awarded grants to, and seeing the positive impact that their money has had within the community. Nigel, having worked in business his entire career, wanted the best return on their money. The Foundation was the perfect solution. No one else is as effective in linking donors with charitable organisations and ensuring that our support is used to the best effect. We have met lovely people including other donors. It is a privilege to know all of these people. Most of all, it has been fun! You can read more about the Nigel and Alison’s giving with us in our Philanthropy Brochure.